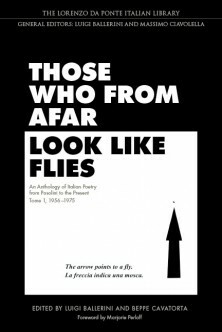 Those Who from Afar Look Like Flies is an anthology of poems and essays that aims to provide an organic profile of the evolution of Italian poetry after World War II. Beginning with the birth of Officina and il Verri, and culminating with the crisis of the mid-seventies, this tome features works by such poet as Pasolini, Majorino, Pagliarani, Rosselli, Sanguineti, and Zanzotto, as well as such forerunners as Villa and Cacciatore. Each section of this anthology, organized chronologically, is preceded by an introductory note, and documents every stylistic or substantial change in the poetics of a group or individual. For each poet, critic, and translator a short biography and bibliography is also provided. When I received the poetry anthology Those Who from Afar Look like Flies in the mail, I was reminded of an anecdote about the American poet Ezra Pound. Upon being asked by a friend which of two English-Italian dictionaries was the best, he picked up each one in turn, and without opening either handed the heftier tome to his friend saying with absolute certainty: “This one”. By such Poundian standards, this anthology is indeed an impressive achievement: to limit myself to its physical characteristics, let me just say that it clocks at 2051 finely printed pages, not counting the coloured plates reproducing Magdalo Mussio’s remarkable visual poem (if that’s the right description) In pratica, haunting in its untranslatability and indeed unreadability. I am not an expert of poetry anthologies – or, arguably, even of poetry – but in sheer size this volume dwarfs any of its antecedents, Italian or in translation, discussed in great detail in the introduction by the two editors, Luigi Ballerini and Beppe Cavatorta. It certainly doesn’t look like a fly, from afar or otherwise! Unlike the dictionary, however – Pound had famously little patience for or interest in spoken Italian, in spite of having spent much of his life in Italy – this is certainly a book that he would have opened with enthusiasm, and in which he would have recognized himself as one of its patron saints. Indeed, it certainly not by chance that his name appears at two key points of the editors’ introduction: at the beginning, where his dictum “make it new” is evoked as the ideal towards which not only poetry but also anthologies should strive, and towards the end, when he is singled out (along with Eliot) as the strongest link in a chain connecting Italian and American research poetry in all its configuration, including Pasolini (as far as I am concerned, one of the best discoveries I’ve so far made through this anthology, of which I have only begun to scratch the surface, is the touching TV interview between Pasolini and the old Ezra Pound of which a few fragments can be found on youtube). “Make it new” might well be the emblem of what I understand to be the crucial programmatic impulse at the heart of this remarkably comprehensive and complex volume: documenting the enduring life and transformations of what the editors call “research poetry” after World War II. We can speak of research poetry when the natural and spontaneous expression of things is called into question, promoting an investigative mode into the signifying potential of language in all its material and historical configuration. The term, the editors argue, has the advantage of focusing the attention on what is proper to poetry, namely language – “the term signifies a specific poetic tendency that characterizes a select number of linguistically oriented authors”, they further write; it also allows them to eschew more artificial categories such group labels and assorted “-isms” in their selection. There is not one but two “polar stars” in this form of poetry, and, it seems to me, both place “research poetry” in a relationship of continuity with and overcoming of the historical avant-gardes of the first half of the twentieth century. On the one hand, the “opposition to the dictatorship of the grammatical ‘I’”, to quote Ballerini and Cavatorta again, which continues the anarchic battle against linguistic hyerarchization first engaged – if not always really fought – by the Futurists, who famously called for the “eradication of the I” and the displacement of the psychology of man from the centre of the artistic stage in Marinetti’s “Technical Manifesto of Futurist Literature.” On the other, the destabilization of the normal relationship between words and things brings to the fore the “experimental” dimension of poetry, understood in the sense that Pound himself gave to the notion when he compared the poet to the scientist as someone who gets to the new by observing closely the material that he studies and asking new questions to it. Like science, research poetry is able to continue discovering “the new” by simultaneously questioning everything – indeed, questioning its very foundations, language itself – and by remaining aware of its own limitations, “of the fact”, and I quote again the editors here, “that it must remain, in spite of everything, poetry and therefore fantasy, imagination, dream”. where one can, among many other things, catch echoes of politics (Indian first Prime minister Jawaharlal Nehru), Edoardo Vianello’s pop song “I Watussi”, the Bible by way of the Beatles or maybe the Beat generation poets or maybe both (Joe il Beat/tista), and puns that would have made Lacan envious (phalluciNations) – a verse like this, I say, feels like Joyce on steroids, a world away from Delfini, and yet driven by a similar sense of urgency before the death drive at the heart of the twentieth and twenty first century. I would also like to say a couple of words about the pedagogical uses of this book. In the first instance, it is without a doubt the most thorough and complete overview of post-Italian Italian poetry in any language, so we shouldn’t let ourselves be fooled by the English translations facing each poem: this volume has a lot to say and teach to those of us who can as easily read the works in the original Italian. That said, the translations insert contemporary Italian poetry in a much wider circuit that allows it to enter into dialogue with related poetic experiences in the Western world, as suggested in the foreword by Marjorie Perloff, perhaps the foremost authority on modern poetry in North America, who notes intriguing relations between the poets anthologized and their American contemporaries such as Charles Reznikoff, Louis Zukofsky or Frank O’Hara. The kind of comparative critical research that Perloff can only begin to hint at here, and that the editors themselves also allude to in their introduction, can only be facilitated by the copious critical apparatus that complements the text. The first section, for instance, documents the “querelle” on the overcoming of realism and the meaning and scope of experimentalism that initially saw Pasolini and Sanguineti cross poetic blades on the pages of the journal Officina with, respectively, “In morte del realismo” and “Una polemica in prosa”. The section includes not only the two poems, but also several essays by Pasolini and Franco Fortini as well as with Pasolini’s “Piccola antologia neo-sperimentale”, translated in its entirety, a remarkable example of the dovetailing of criticism and anthologizing that might even serve as a miniature blueprint for the volume that now contains it. Indeed, each section is rounded off by a generous selection of critical material, often by poets wearing for the occasion the hat of reviewer or critic, that adds to the poetic anthology a critical anthology that I think might prove almost as useful as the main text. Indeed, and I am speaking now in my capacity as teacher, this seems to be a book thought with the classroom in mind: by framing the poems and the poets within the critical and cultural debate to which they both responded and gave rise, the book maps out a moment of post-war Italian culture and gives teachers and students the documents to unravel some of its treads and to weave with them new patterns and configurations. Finally, this is and must be also a book for the general, curious, casual reader. In that respect, each of us must find their individual passcode or access key – of, if you prefer, their individual set of instructions for use. As for myself, there are sections that in due time I plan to read in detail, and others that at this moment interest me up to a point and may stay on the back-burner for a while. For now, however, I’m quite happy to plunge in an see what surprises come up, like the serendipitous and revealing juxtaposition of Delfini and Diacono just described. And if that sounds like relying too much on dubious criteria, well, if it worked for Ezra Pound, it works for me.